Thought Balloons - Creating Comics One Page At A Time: Why (Beware) the Creeper? Ditko in his studio, 1959. Rand's views are known as Objectivism, best summarized as a mathematical axiom A=A, or that which is, is. It is a complete rejection of anything that cannot be proven as a reality, and a central idea of this is that right and wrong, love and hate, are born out of reason, and not faith-based morality. This ethos would then be championed by those who build themselves from the ground up, not by those who are granted material or social advantages from the get-go. There are echoes of this in both Peter Parker and Stephen Strange, as well as Ted Kord and Vic Sage. Ditko's self-published Mr. A is the purest distillation of this, and alienated him from many of his contemporaries. In fact, the Creeper's alter ego, Jack Ryder is an obnoxious extreme of the Randian ideal; even his television show, "You Are WRONG!" reflects Ditko's mindset. Unfortunately, this flew far in the face of the counterculture at the time. Free love, anti-war sentiment, and psychedelia were the hallmarks of '60s youth. Psychotropic drugs, LSD and psylocibin mushrooms in particular, were altering perceptions, subjugating reality and replacing it with a chemically altered mental state. A was now a non-A, and to Ditko, that way lay madness. The Creeper, then, is a backhanded morality tale. Jack Ryder is the unwilling subject of Dr. Yatz, given both experimental technology and an injection of unknown pharmacological slurry. With these he can switch back and forth between being Ryder and being the Creeper, who is agile, hypernormally perceptive, and strong. 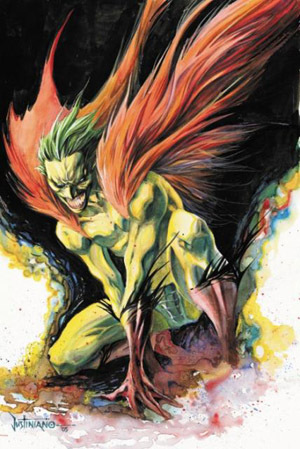 However, over time, the Creeper develops his own personality, first 70s kooky prankster, then 80s mischievous goofball, then downright twisted and insane in the 90s. The more Ryder let's the Creeper out, the more dominant he becomes, until finally they become a worst-case-scenario multiple personality disorder. So...what are YOU doing after the Why? Labels: R.A. Wonsowski, The Creeper, Why, Why? R.I.P. Steve Ditko. Thank you.